Thermal Response Estimation in Substation Connectors Using Data-Driven Models, GIACOMETTO, F., CAPELLI, F., ROMERAL, L., RIBA, J.-R., SALA, E.
Redesign of Morphing UAV for Simultaneous Improvement of Directional Stability and Maximum Lift/Drag Ratio, ARIK, S., TURKMEN, I., OKTAY, T.
QIAN, L. , FANG, C. , DOBRE, O. A. , LIU, H. , WU, J. Even if the traffic pattern is known and the network topology is simple, a strong congestion can take place in wireless sensor networks (WSNs) due to the data gathering effect and the duty-cycle operation. In this paper, we propose a novel medium access control (MAC) protocol to alleviate the congestion, which is referred to as the congestion alleviation-MAC (CA-MAC). It adopts an adaptive contention window (ACW), which allows the nodes with more buffered packets to transmit with a higher probability, as well as an intelligent burst packet transmission when the congested nodes seize the channel. Simulations are performed in NS-2, and results show that the proposed CA-MAC protocol achieves a good performance in terms of the packet delivery ratio (PDR), power consumption, throughput, and average latency. I. F. Akyildiz, W. Su, Y. Sankarasubramaniam, and E. Cayirci, "Wireless sensor networks: a survey," IEEE Communications Magazine, vol. 40, no. 8, pp. 102 - 114, Mar. 2002. I. Demirkol, C. Ersoy and F. Alagz , "Wireless sensor networks: A survey," IEEE Communications Magazine, vol. 44, no. 4, pp.115-121, Apr. 2006. C.-Y. Wan, S. B. Eisenman, A. T. Campbell, and J. Crowcroft, "Overload traffic management for sensor networks," ACM Transactions on Sensor Networks, vol. 3, no. 4, pp. 18-es, Oct. 2007. W. Ye, J. Heidemann, and D. Estrin,, "An energy-efficient mac proto-col for wireless sensor networks," in Proc. IEEE INFOCOM, 2002, pp. 1567-1576. M. Ringwald and K. Romer, "Bitmac: A deterministic, collision-free, and robust mac protocol for sensor networks," in Proc. Second European Workshop on Wireless Sensor Networks, 2005, pp. 57 - 69. F. Yu, T. Wu, and S. Biswas, "Toward in-band self-organization in energy-efficient mac protocols for sensor networks," IEEE Transactions on Mobile Computing, vol. 7, no. 2, pp.156-170, Feb. 2008. O. Younis and S. Fahmy, "Heed: A hybrid, energy-efficient, distributed clustering approach for ad hoc sensor networks," IEEE Transactions on Mobile Computing, vol. 3, no. 4, pp. 366 - 379, Oct.-Dec. 2004. S. H. Lee, J. H. Park, and L. Choi, "Amac: Traffic-adaptive sensor network mac protocol through variable duty-cycle operations," in Proc. IEEE International Conference on Communications, 2007, pp. 3259-3264. G. Lu, B. Krishnamachari, and C. S. Raghavendra, "An adaptive energy efficient and low-latency mac for data gathering in wireless sensor networks," in Proc. International Parallel and Distributed Processing Symposium, 2004, pp. 224-230. D. Shu, A. K. Saha, and D. B. Johnson, "RMAC: A routing-enhance-d duty-cycle mac protocol for wireless sensor networks," in Proc. IEEE International Conference on Computer Communications, 2007. pp. 1478-1486. C. Fang, H. Liu, and L.L. Qian, "LC-MAC: An efficient mac protocol for the long-chain wireless sensor networks," in Proc. International Conference on Communications and Mobile Computing, 2011, pp. 495-500. J. Polastre, J. Hill, and D. Culler, "Versatile low power media access for wireless sensor networks," in Proc. International Conference on Embedded Networked Sensor Systems, 2004, pp. 95-107. M. Buettner, G. V. Yee, E. Anderson, and R. Han, "X-MAC: a short preamble MAC protocol for duty-cycled wireless sensor networks," in Proc. International Conference on Embedded Networked Sensor Systems, 2006, pp. 307-320. Y. Sun, O. Gurewitz, and D. B. Johnson, "RI-MAC: a receiver-initiated asynchronous duty cycle MAC protocol for dynamic traffic loads in wireless sensor networks," in Proc. International Conference on Embedded Network Sensor Systems, 2008, pp. 1-14. B. Hull, K. Jamieson, and H. Balakrishnan, "Mitigating congestion in wireless sensor networks," in Proc. International Conference on Embedded Networked Sensor Systems, 2004, pp. 134-147. Y. Sankarasubramaniam, O. B. Akan, and I. F. Akyildiz, "Event-to-sink reliable transport in wireless sensor networks," in Proc. ACM MobiHoc, 2003, pp. 177-188. C. Y. Wan, S. B. Eisenman, and A. T. Campbell, "Coda: congestion detection and avoidance in sensor networks," in Proc. International Conference on Embedded Networked Sensor Systems, 2003, pp. 266-279. H. Gong, M. Liu, Y. Mao, L. J. Chen, and L. Xie, "Traffic adaptive mac protocol for wireless sensor network," Networking and Mobile Computing Lecture Notes in Computer Science, vol. 3619, pp. 1134-1143, Aug. 2005. N. Saxena, A. Roy, and J. Shin, "Dynamic duty cycle and adaptive contention window based QoSMAC protocol for wireless multimedia sensor networks," Computer Networks, vol. 52, no. 13, pp. 2532-2542, Sept. 2008. 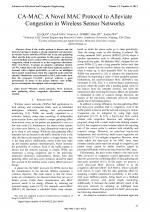 G. S. Ahn, S. G. Hong, E. Miluzzo, A. T. Campbell, and F. Cuomo, "Funneling-mac: a localized, sink-oriented mac for boosting fidelity in sensor networks," in Proc. International Conference on Embedded Networked Sensor Systems, 2006, pp. 293-306. H. Zhai and U. Fang, "Distributed flow control and medium access in multihop ad hoc networks," IEEE Transactions on Mobile Computing, vol. 5, no. 11, pp. 1503-1514, Nov. 2006. T. S. Rappaport, Wireless Communications Principles and Practice. Second Edition, pp. 120-125, Prentice Hall, 2001. 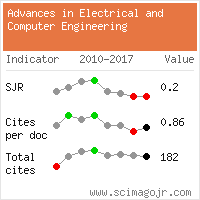 Citations for references updated on 2019-04-23 18:50 in 149 seconds.